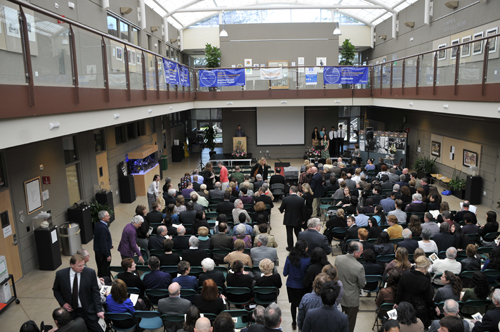 More than 500 students, teachers, parents, alumni and family members gathered in the Nichols Hall atrium March 10, to celebrate the life of Sharron Mittelstet. The much loved teacher, a 20-year veteran of Harker’s English department, succumbed to the debilitating effects of Creutzfeldt-Jakob disease Feb. 2. The event featured a performance by teacher Laura Lang-Ree who sang “Let it Be,” accompanied by colleague Catherine Snider and seniors Govi Dasu, Alex Najibi, Lauren Pinzás and Noel Witcosky. Seniors Jun Hee Lee and Devin Nguyen created a photo montage for the event, and Cantilena, directed by Susan Nace, contributed a recording of “This Little Light of Mine,” which was played at the end of the service. Head of School Chris Nikoloff fondly recalled speaking to Mittelstet about Huck Finn. “She talked about Huck as if she knew him, as if he were one of her students,” said Nikoloff, who added Mittelstet “saw a uniqueness worth celebrating” in Huck much as she did the hundreds of students she wrote letters of recommendations for over the years. Sharron Mittelstet made a tremendous, positive impact on the lives of many children during her distinguished teaching career at The Harker School. In return, initiated by her husband, John Mittelstet, we are proud to provide scholarship assistance in honor of Sharron Mittelstet to motivated and talented children who would otherwise not be able to attend Harker. Families wishing to contribute to this endowed scholarship fund can make their checks payable to The Harker School in memory of Sharron Mittelstet. Contact the executive director of advancement, Joe Rosenthal, at joer@harker.org with questions. Your contribution will be invested in the associated endowed scholarship fund. Through this fund, Sharron Mittelstet will continue to positively impact Harker students in perpetuity. Those wishing to send condolences can send them to Lori Villarreal at loriv@ harker.org and they will be passed on to the family.